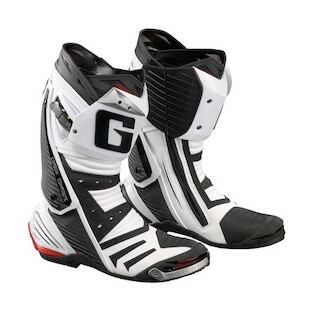 The Gaerne GP-1 Racing Boots are racing boots built to perfection. 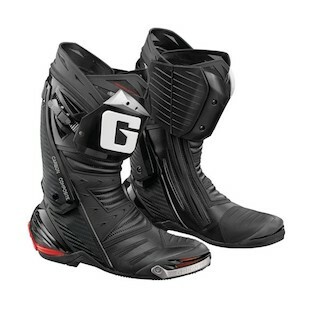 Fresh from Gaerne in collaboration with Champions, the GP-1 Racing boots are technologically innovative with Italian style and comfort to match.The boots are built with the Gaerne floating system that allows the foot to move naturally and prevents the ankle from twisting without sacrificing flexibility. Towards the back of the boot, and fixed at two points, the carbon composite system runs inside two slots that limit movement in both directions preventing compression or hyper extension. These Gaerne boots come with a great amount of features for any serious racers out there looking for a racing boot that is going to do more than just look good. The outer shell is composed mostly of Lorica, a comfortable and breathable high-tech material. The front shin plate is made of PU and is anatomically shaped and is interchangeable. The heel cup is made up of non-deformable polyurethane and is protected by a replaceable low-friction magnesium slider. The heel is also shock absorbing which will help save the rider from some nasty injuries in the unfortunate even of a fall or crash. The inner liner of the boot is made of an antibacterial and breathable pre-shaped inner lining for enhanced comfort and fit at shin, ankle, and heel areas. The inner sole is fully removable and washable, and is designed to ensure even weight distribution and provide total support to all parts of the rider's foot.